Next month’s election will likely feature serious irregularities. The blame should be shared. A recent report in The Wall Street Journal quotes Nader Nadery, an Afghan civil society activist, claiming that Afghan President Hamid Karzai is backing a specific candidate in next month’s presidential election. Nadery later denied making the comment. While I make the same claim in a recent article, it would be naive to think Karzai only has one scenario in mind. There can be several possibilities, from a “hung” election to a relatively clear-cut outcome. While the presidency is an disproportionally powerful position in Afghanistan’s highly centralized political system, it is far from fair to blame Karzai for what will clearly be a highly flawed election next month. Both Afghan elites and international actors should share in the blame for why is likely to be yet another rigged election. To begin with, let us look at how Karzai was elected in the first ever presidential election of Afghanistan in 2004. After several regional warlords, stirring ethnic sentiment, chose to run, it became apparent that Karzai would have a hard time passing the 50+1 percent mark in the first round to avoid a runoff and the risk of losing. It was the international community, spearheaded by the United Nations Assistance Mission in Afghanistan, that came up with a clever solution: include Afghan refugees from Iran and Pakistan in the process. Karzai won 80 percent of the vote from the latter, account for around 11 percent of all the votes he got. Since Karzai only won 55.6 percent of the vote in the final tally, the consequences of that decision was as critical to the outcome of the election in question as it was detrimental to Afghanistan’s long-term democratic development. Moreover, that election was widely rigged both by Karzai’s camp and his opponents. His opponents did well in their respective ethnic constituencies: General Abdul Rashid Dostum amongst Uzbeks, Mohammad Mohaqiq amongst Hazaras and Mohammed Younis Qanooni amongst Tajiks. It is perfectly conceivable that they did well because the election had increasingly featured ethnic overtones; it is not at all true that all the votes cast were valid. There were widespread irregularities, chiefly ballot stuffing and intimidation. The international community and international media turned a blind eye as the result was convenient for all involved. Weary of a takeover by warlords, the nascent Afghan civil society remained tightlipped as well. Thus, thanks to the Afghan political elites and international actors, the foundation of elections in Afghanistan was rooted in fraud. Then came the parliamentary elections of 2005. Once again, the elections failed to meet international standards. A large number of votes, especially those of women, were simply stuffed in the ballots with little oversight. In my home province of Paktika, a fact-finding mission from the German embassy approached a sitting parliamentarian about the problems of election day. The response: “Everyone was stuffing the ballots in the boxes, I simply did the same.” It didn’t matter to the international forces. They wanted a high voter turnout so that politicians back home could sell the story as a success. Those first two elections set the scene for what became the most infamous election in the post-Taliban era. In 2009, the incumbent President Karzai faced a stiff challenge, not from his electoral opponents but from a belligerent international community that had grown disillusioned with him. According to former Defense Secretary Robert Gates, the U.S. tried to manipulate the outcome. To fend off the threat, Karzai once again resorted to desperate measures. His principal opponents matched him in every department. What became even more striking was that Karzai’s opponents were not only aware of the plan but became part of it. Afghan civil society – divided – once again failed to play a meaningful role. Following the 2009 election, Karzai embarked on an effort to purge the international community from Afghanistan’s electoral process. 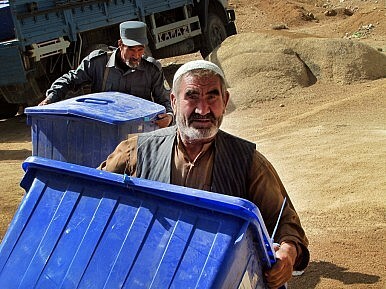 Next month’s election will mainly be conducted, overseen and scrutinized by Afghan-led institutions – as it should be. This does not mean that this election will be better than those that came before it. First, there is broad awareness amongst the candidates that they will all try to rig the vote. It is the perception of fraud, however, that will be key to the future image of different candidates. If Karzai’s network uses nefarious means to turn the election in favor of Zalmai Rassoul, his opponents will be quite prepared to respond in kind. In the run-up to the April 5 vote, several have already sought to portray themselves as victims of a Karzai smear campaign, a strategy designed not only to generate sympathy but also prepare for the post-election era in the event they lose in a free and fair poll. Afghanistan’s civil society and media has never been as deeply involved in an election as it has this time around. Several prominent figures are either overtly or covertly campaigning for different candidates, dispensing with their organizations’ principle of impartiality. In the process, they are also using resources that were paid for by foreign donors. The donors themselves are either unaware or uninterested. So once again, it will be Hamid Karzai who will be blamed for the inevitable irregularities on election day in Afghanistan. But that is unfair. Almost all Afghan elites will be complicit, although they will shift blame with the aim of either elevating their standing in the eyes of the ordinary Afghans or grabbing a share of power or other benefits from the eventual victor. Malaiz Daud is a PhD student at the Free University of Berlin and an Associate Research Fellow with the Barcelona Center for International Affairs (CIDOB). He has worked for the Afghan government and a number of Afghan and international NGOs. He is a co-founder of the Afghan Youth Foundation for Unity and Young Leaders Forum.